House music. Six or so years after a journalist said dance music was dead it’s once again the dominant force in electronic music. How long that will last who knows or cares. It always comes round again because people always love losing it on the dancefloor to a rhythm that matches their heartbeat. 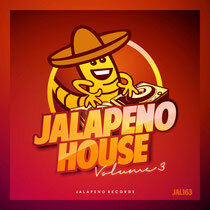 They’ve always been partial to a 4/4 beat at Jalapeno and this latest release, ‘Jalapeno House Volume 3’, is a collection of remixes and original tracks showcasing what they do. From the silky Satin Jackets mix of Gero to the scarlet pimpernel of house Kid Crème, through this year’s Ibiza hero Solomun and underground hipsters Psychemagik, the album has some great cuts for your ears. The compilation also features tracks and remixes by Kraak & Smaak, Romanthony, Golden Girls, Detroit Swindle, Marcus Jakes and Moullinex. It’s out 18 November, check it out below.